Nisekoi: Chitoge & Kosaki is an Event Course in Super Mario Maker, released on February 18, 2016. It is one of two Event Courses to unlock the Chitoge Kirisaki Mystery Mushroom costume upon completion. It is based on the Nisekoi manga and anime. The level begins with two paths to choose from, both containing specific Japanese characters. The left path consists of cloud platforms with Japanese characters, along with a few enemies on them. A Checkpoint Flag appears afterward, along with some ? 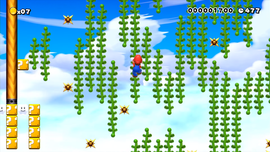 Blocks arranged to form Japanese characters, with Arrow Signs guiding Mario to some Fire Flowers. The right path consists of beanstalks and lifts. After the Checkpoint Flag, Mario must jump on all of the Flimsy Lifts, hit the ? Blocks on tracks, then ride a Lava Lift and get off of it just before a barrage of Cannons hit him. Mario must then hit two ? Blocks to produce beanstalks and enter a warp pipe. This page was last edited on July 5, 2017, at 07:47.